Sathyabama University Entrance Exam 2018 will be conducted by Sathyabama University on all India basis for admission to all B.Tech, B.E and B.Arch programmes in the academic session 2018-19. Sathyabama University Application Forms are available from 1 November 2017 until 6 April 2018. Scroll down to get details about Sathyabama University Entrance Exam 2018. At present, the University offers 27 Under Graduate programmes, 41 Post Graduate programmes and Ph.D., Programme in Engineering, Technology, Science, and Management. Sathyabama University admits students into Under Graduate Engineering, Technology, Architecture and Dental Surgery programmes based on the All India Entrance Examination conducted by the University every year. Sathyabama University fee structure for all UG courses is given here. Latest Update: Candidates can book their slot for Sathyabama University 2018 Entrance Exam and also download Admit Card from the link given below. 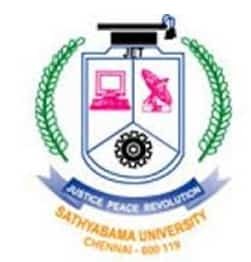 Sathyabhama University Mock Test - Candidates will require their Application and Mobile Number to practice Mock Test for the computer-based entrance exam. The courses offered in B.E and B.Tech are mentioned below. The duration of each course is 4 years. Architecture Courses Offered: Sathyabama University also offers B.Arch Course. The duration of B. Architecture is 5 years. Age Limit: The candidate's date of birth should be on or after January 1, 1998. Academic Qualification: Candidates who have passed Class 12 Exam or any equivalent qualifying examination from any recognized Board or CBSE/ICSE with minimum 60% marks in Mathematics, Physics, and Chemistry. Candidates who are appearing in Class 12 Board Exam in March/April 2018 can also apply. Candidates should have passed class 10 or equivalent examination either with 60% marks or "6.0" CGPA. Academic Qualification: Candidates who have passed Class 12 Exam or any equivalent qualifying examination from any recognised Board or CBSE/ICSE with minimum 60% marks in Mathematics/Biology, Physics, and Chemistry. Candidates should have passed Class 10 or equivalent examination either with a minimum aggregate of 60% marks or "6.0" CGPA. Candidates should have secured valid marks in National Aptitude Test in Architecture (NATA), conducted by Council of Architecture. Candidates should have passed 10th class or equivalent examination with a minimum of 60% marks or "6.0". The candidates can apply any one of the 2 modes to apply for the undergraduate B.Tech. B.E and B. Arch programs. The candidates can submit the filled-in application form in any mode until 6 April 2018. Mode 1: Candidates can purchase the application form on payment of Rs. 950 at Sathyabama University Campus. The request letter should reach on or before 26 March 2018. Mode 2: Candidates can apply online at the Official web page on or before 6 April 2018. Once the candidate has filled all the details online, they are required to verify all the details before making the payment. After the verification, candidates are required to make the payment of Rs. 950 either by Net Banking Facility/Credit Cards (VISA and Master)/Debit Cards (VISA and Master) or by Indian bank challan mode at any one of the Indian Bank branches. Applications received without fee payment will not be considered for writing an entrance examination. The candidates who have filled the application form in offline mode need to submit the application form to complete the application process. The candidates are suggested to ensure that the details filled by them in the application form are correct in all manner. The duly filled in application form should be submitted to the following address on or before the due date i.e. 6 April 2018. The candidates who have submitted the applications through online mode need not send any printed forms/account statement/bank or institution challan. However, candidates should note the application number, login username and password for future reference. Sathyabama University 2018 Slot Booking / Download Hall Ticket: Candidates can now book the slot and download the hall ticket for Sathyabama University Entrance Exam from 19 April 2018 until 22 April 2018. The fees structure for B.E, B.Tech and B.Arch is given below. Candidate can pay their fee through net banking, debit card, credit card, and e-challan (Indian Bank only). It is advised to keep a receipt of fees for future reference. The admission fee is Rs. 25000 and Student amenity fee is Rs. 10000 which will be submitted one time only. The total amount has included both fees. B.Arch is 5-year duration course. The admission fee is Rs. 25000 and Student amenity fee is Rs. 10000 which will be submitted one time only. The total amount has included both fees. Kindly Note: Hostel Facility is not mandatory and Hostel allocation will be offered on First come First serve basis. Sathyabama University Entrance Exam 2018 Results will be declared on tentatively 5 May 2018. Candidates will also be able to download the Sathyabama University Counselling Call letter on the same date. Sathyabama Counselling will be conducted tentatively from 21 to 26 May 2018. The candidates who qualify All India Entrance Examination 2018 conducted by Sathyabama University are eligible for the Admission to B.E., / B.Tech., / B.Arch., courses. As per the performance in the All India Entrance Examination 2018 conducted by Sathyabama University, candidates will be shortlisted for Counseling, which will be conducted at the Sathyabama University campus, Chennai. Type and number of questions: Multiple choice and objective type & 180 questions. The top 25 rank holders of Sathyabama University entrance examination 2018 will be eligible for scholarship i.e Full Waiver of Tuition Fee throughout the duration of the programme (4 years). University offers REMIBAI JEPPIAAR SCHOLARSHIP to students who secure the top three positions in the University Semester Examinations. A student consistently maintains top rank in eight consecutive semesters is eligible for a maximum Scholarship. Entrance examination will be conducted by computer-based mode in 3 sessions/slots (9.00 A.M. to 11.30 A.M., 12.30 P.M to 3.00 P.M. and 4.00 P.M. to 6.30 P.M) for mathematics opted candidates on each mentioned dates/days. But for biology opted candidates entrance examination will be conducted by computer-based mode only in the first session (9.00 A.M. to 11.30 A.M.) on 28 and 29 April 2018 in all cities. Exact venue and address of the centre will be mentioned in the Hall ticket. Candidate can see the list of examination centre along with codes here. Sathyabama University Slot Booking and Hall Ticket 2018 - Started!